I've been considering doing that too. It's only $40, right? Even if I don't play it right away, I'll probably be in the mood to at some point. ^My current plan is to buy it if for no other reason than to support the Metroid franchise. And, well, to compare it to AM2R. But mostly the first one. I really want to see if they did a decent job, if the melee taps are setup well (like, not the worst idea, just was poorly executed like most things in MOM:theBABY), and yeah to show my heartfelt love for a new 2D Metroid. Zero Mission was one of the best in the series, and I've wanted an official remake of Metroid II since forever. I put in my preorder a week or two ago. Now I'm avoiding info, so I'll be surprised if Thanos and Vince Vaughn appear. I should preorder to be honest. This is just about the only thing next to a new F-Zero that Nintendo could do to actually get me to pay for a new 3DS game. You don't already have 52 copies ordered? I question your faith. Recanting my previous statement about being disappointed that Samus Returns is a remake. As much as I'd love a totally new original 2D Metroid, this game actually looks pretty awesome. Anyone want to make bets on whether Return of Samus will be included as an unlockable extra? I'm doubting it. Smaller things like sound test are already tied to Amiibo (something I'm annoyed about) and Metroid II is on the e-shop. I can't see them giving the original game away anymore. That would be great, but I stopped thinking they'd do that kind of stuff when they tried to sell the first Metroid on its own for GBA, not long after Zero Mission which already included it. Went ahead and pre-purchased the game. I'm getting pretty excited about it. I played a few minutes. I'm pleased to say that the controls feel really good. Samus moves a lot like she does in previous 2D games, and switching to and from free-aim is convenient and easy to do. 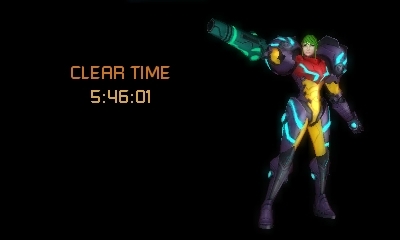 I haven't gotten the hang of parrying yet, but that's mainly because I keep forgetting Samus can do that, and I imagine it'll get easier with time. I like how the game starts quickly. I'd say it starts fatser than Super and Fusion but a bit slower than Zero Mission. The Nintendo DS has and its derivatives have been around for almost 13 years, and yet this is first time we've gotten a handheld 2D Metroid game since then. It's a crying shame it took this long, because having a second screen devoted to the map is awesome. You're definitely not starved of missiles in this game. Even without the frequently-encountered expansions, you still start with a ton of them. I've gotten pretty wasteful with my missiles and I still don't think I've ever run out. Teleporters make backtracking much more painless. I don't usually mind backtracking in Metroid games since it's such a staple of the series, but it's definitely less of a drag in a game like Super where all of the areas of Zebes are intricately connected. Backtracking was much more annoying in Metroid II due to the relatively linear layout of the world, so the teleporters are a welcome addition. It's interesting how the Ice Beam is no longer a mere upgrade to the Power Beam; it's its own weapon with its own unique function, yet does so little damage in most cases that when trying to kill foes you're better off using the Power Beam. I like this. Rather than having the Ice Beam supplant the Power Beam as your primary weapon, you now have two beams that are each useful in different situations. I'm guessing the third beam will follow this pattern. I just got back with the game, soon as I got home and saw it released today. Wasn't expecting that, as normally releases don't happen on a weekend here, but it's a surprise I'm happy to have. In the short term, I can't decide if I want to get this or the Zelda DLC...leaning towards this right now. I've played through the first bit of it so far, and let me just say that the game is absolutely gorgeous, the 3D effect has the perfect amount of depth, and the play is so far exactly what I want from Metroid. Also, the music is at a really solid spot between Super Metroid, Prime, and Metroid II. The fact that the few Metroids I've encountered do not all behave the same as one another and the common hazard/enemies don't behave the same as the original game have really gone a long way to making this feel new. I've noticed a number of powerups blocked by odd crystal clusters that look kind of like the ones THE BABY chows on at the end of the original game. I wonder if, similar to Zero Mission, there's going to be additional gameplay after the Metroid Queen is killed where you can further explore SR388 with THE BABY in tow? Finished the game 100% with a time of 9:18. Also, check out the gallery after you've beaten the game 100%. Now, if you're doing an item hunt at the end of the game, you're probably looking at thin tunnels layered with red crystal spikes and thinking, "how do I get past this?" Well, the game doesn't quite tell you, but you might be able to figure it out yourself. If you can't and want someone to tell you how to deal with it, check this spoiler. Lay a Power Bomb while using the Spider Ball. I'll post my full thoughts on the game another time. TBH I think this is probably the best looking game Nintendo's ever made. The 3D even adds so much to the contrast and all the colors are perfect. 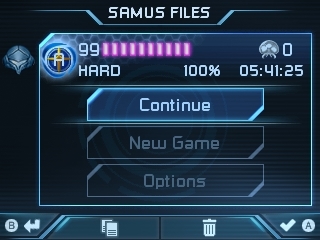 100% Hard Mode, had a really sloppy item collection in Area 4 and somewhere else. I guess sub-4 could be my next goal. Beat the game. 100% items, 9:39:38 clear time. I'll post my final thoughts about the game in a bit.